Wow. Cool beans, I thought. You can read the complete article discussing the study here. As someone who has occasional migraines, the idea of preventing these smack-one-in-the-head-and-leave-one-flat incidents is very appealing, especially if the preventative agent is something as easily obtained and inexpensive as 3 mg of melatonin. "I'm not aware of any major side effects associated with melatonin. As long clinicians instruct patients appropriately and emphasize the importance of taking the recommended dose at the same time every day it may be worthwhile," he said. Blood pressure medications -- Melatonin may reduce the effectiveness of blood pressure medications like methoxamine and clonidine. In addition, medications in a class called calcium channel blockers (such as nifedipine, verapamil, diltiazem, amlodipine, nimodipine, felodipine, nisoldipine, and bepridil) may decrease melatonin levels. Use of beta-blockers (another class of high blood pressure medications that includes propranolol, acebutolol, atenolol, labetolol, metoprolol, pindolol, nadolol, sotalol, and timolol) may reduce melatonin production in the body. Blood-thinning medications, anticoagulants -- Melatonin may increase the risk of bleeding from anticoagulant medications such as warfarin. The body makes melatonin. Birth control pills seem to increase how much melatonin the body makes. Taking melatonin along with birth control pills might cause too much melatonin to be in the body. Taking fluvoxamine (Luvox) can increase the amount of melatonin that the body absorbs. Taking melatonin along with fluvoxamine (Luvox) might increase the effects and side effects of melatonin. Melatonin might increase blood sugar. Diabetes medications are used to lower blood sugar. By increasing blood sugar, melatonin might decrease the effectiveness of diabetes medications. Monitor your blood sugar closely. The dose of your diabetes medication might need to be changed. Melatonin might slow blood clotting. Taking melatonin along with medications that also slow clotting might increase the chances of bruising and bleeding. Nifedipine GITS (Procardia XL) is used to lower blood pressure. Taking melatonin might decrease the effectiveness of nifedipine GITS for lowering blood pressure. 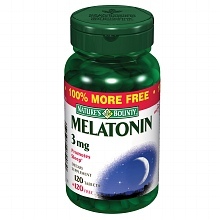 Melatonin might cause sleepiness and drowsiness. Drugs that cause sleepiness and drowsiness are called sedatives. Taking melatonin along with sedative medications might cause too much sleepiness. My goodness. That little OTC supplement sitting benignly in the grocery store can cause my prednisone and immunosuppressants to be ineffective?! And alter blood clotting times, increase blood sugar, and change the effectiveness of blood pressure medications? I think I'll pass on the melatonin, thank you very much.
.::NEVER take any supplements or over the counter medications without checking with your health care provider::. Just because you can buy this and other supplements in any grocery store doesn't mean that it would be appropriate -- or safe -- for you and your individual medical concerns. I am in the clear! I take no medications and have migraines fell me two or three times a month- I have never taken anything stronger than tylenol or acetaminophen for them- so I am thrilled to find another OTC alternative! Great post! So many people think that if something is sold OTC it's perfectly safe for them to take. Wow, thanks for the information!